The last time I was in this building it was for a California Guitar Trio concert, a few years back. That was when this place was called Crosstown Station and although it has since become the home of the Church of the Resurrection Downtown, it maintains a lot of its concert hall atmosphere. As I made my way into the building, I recognized the repurposed drum light fixtures from before. The lights were dim, there was background music playing and people were mingling and shuffling in. I went up to the front, where I was to meet my friend Julie, who had so kindly invited me after I posted about how much I enjoyed reading Pastor Adam Hamilton’s latest book. This church, it turns out, is the downtown campus of the Church of the Resurrection in Leawood, which is lead by Pastor Hamilton. “Service begins in 11:32,” read the notice at the top of the screen as I walked down the aisle. I’ve been to a lot of churches in my time, but never one where there was a countdown to service. It was kind of exciting, I must admit. There were announcements projected on rotation, mission trips, social events, church programs and a reminder to mute phones. My friend arrived a few minutes later, somewhere around “Service begins in 5:27.” We sat down and within a couple of minutes a group of musicians started taking their place on stage. As soon as the countdown reached 0:00, the band kicked off the service. 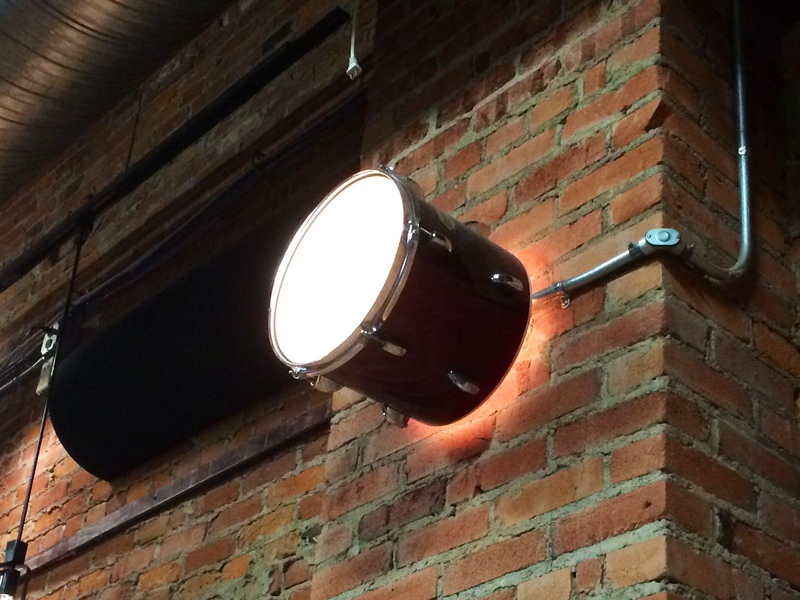 Look at this awesome drum light fixture. The church left a lot of the decor and features from the previous tenant. This is a church with a decidedly urban bent. The music, the lighting, the ambiance and the screen’s background images of Kansas City skylines all emphasize the Downtownness of this church. The music was good, and even though I was unfamiliar with the songs, it was easy to sing along with the words projected on the screen. Soon enough the music came to a stop and Pastor Scott Chrostek took the stage to welcome churchgoers and give a few announcements. As he spoke, the screen behind him projected his name and his Twitter handle, @scottchrostek. I’d never seen this before, but of course my most recent experience of Church has been the technology-free liturgy of High Church Episcopalian mass. This integration of online and offline Church community was not as off-putting as I may have imagined; it actually seemed quite seamless. The sermon was based on the Bible story found in Genesis 12:1-3, where God speaks to Abram and commands him to leave his country and his people for the land he will be shown. The sermon included the story in which Abram had his wife Sarai pass as his sister, so he could be spared death and find favor with Pharaoh. I remembered this story, having just read the Bible a week before, and I wondered how the preacher would handle the fact that Sarai then became part of Pharaoh’s harem. It was a difficult passage and Pastor Maberry made no bones about it, “There are lots of crazy stories in the Bible…sometimes these stories appear to mimic the Jerry Springer Show!” There was laughter and then he went on to talk about how following after God means leaving behind the familiar and how it is that we tend to treat the worst those whom we should love the most. I was moved by the sermon and I appreciated the pastor’s honest take on a difficult passage of Scripture. I really got the sense that this Church embraced all who walked through their doors. 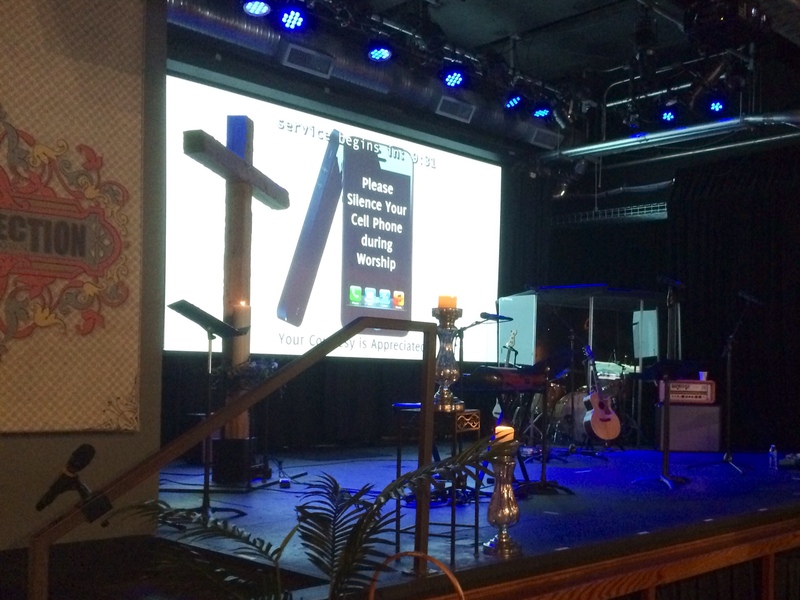 Communion at Resurrection Downtown is available to all. And while all were invited to partake (they even have gluten-free wafers for those who need them), there was no obligation to do so. I always appreciate being invited to a place of worship; it’s a good feeling to know you know someone there. And yet, I’m fairly certain I would’ve been quite comfortable to just walk in uninvited. Everyone I saw seemed to be happy to be there and happy to welcome newcomers. 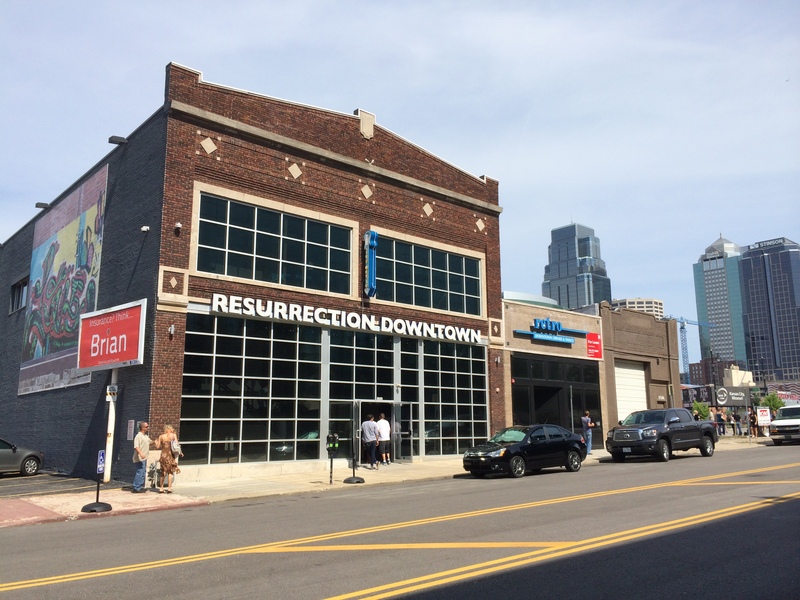 As high-energy music brought the service to a close, I was reminded of the previous life of this building and I thought to myself that if the Crosstown Station had to go, Resurrection Downtown actually seems like a pretty good way to resurrect that space. 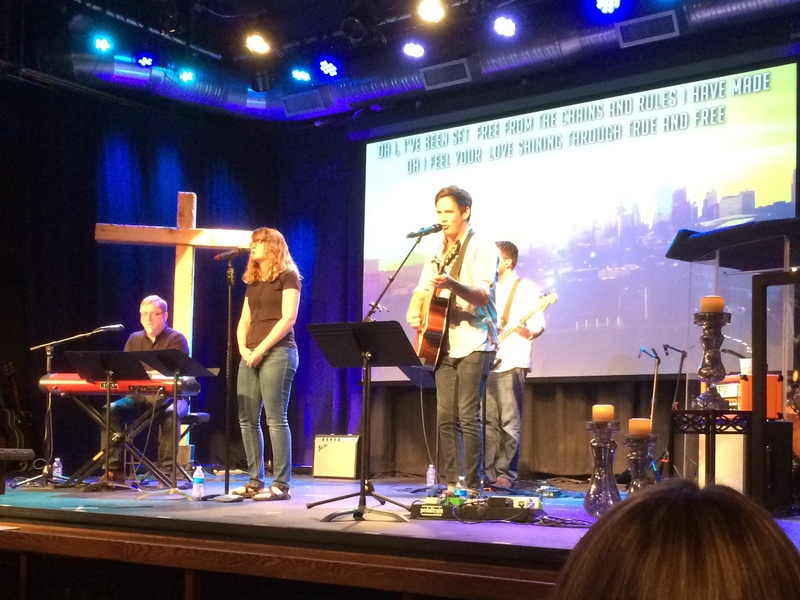 Resurrection Downtown‘s weekly worship services are Saturdays at 5:10 pm and Sundays at 9:00 am, 10:45 am and 5:00 pm at 1522 McGee. Services are family friendly and dress is casual. All are welcome.